Good morning! It's almost the weekend, hooray! 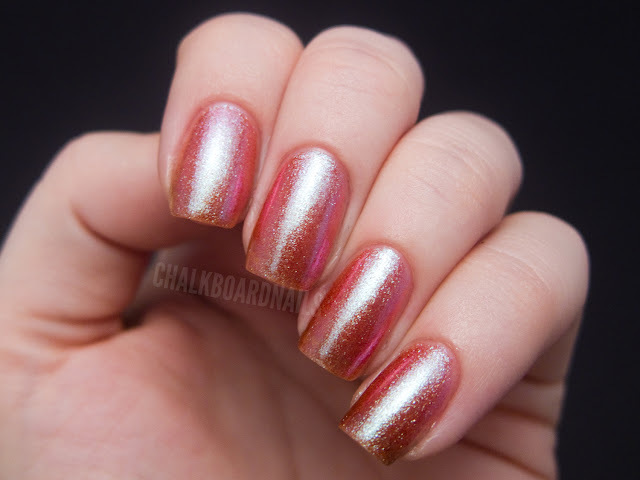 Today I'm sharing a swatch of one of the new Glitter Gal polishes. 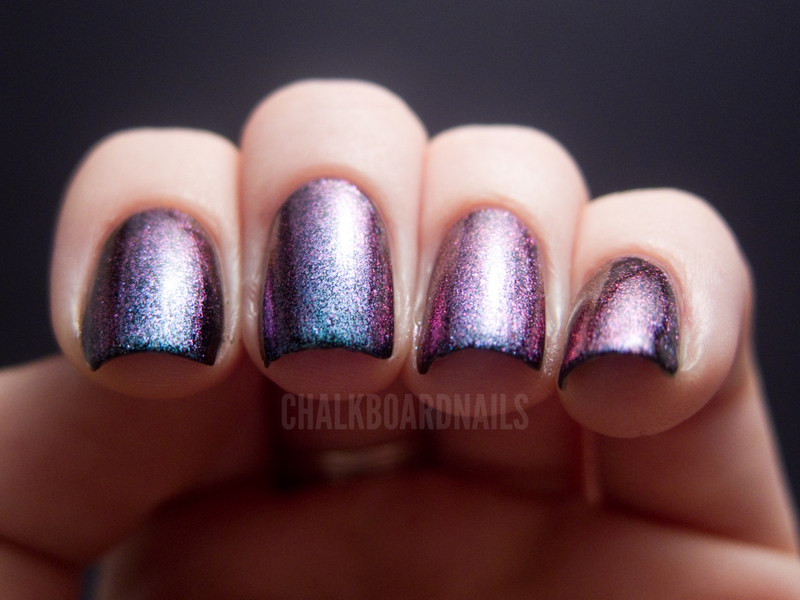 I also have two more new Glitter Gals to show you, but they will get their own posts as well, as I took a lot of pictures for these shades. This one is my favorite of the three. 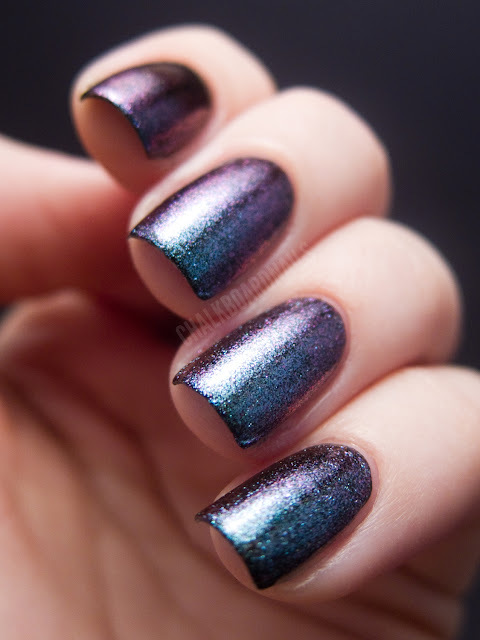 This one is from the Shade Shifters collection and is part of the Brilliant line. It's called Last Light. First, let's take a look at one coat over black. 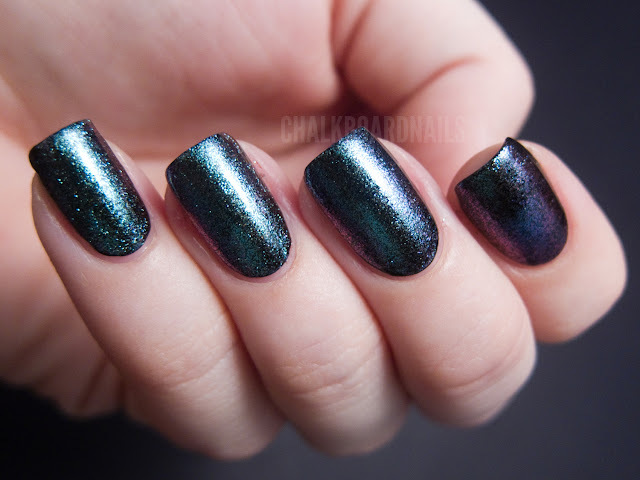 As you can see, the multichrome effect is incredibly strong when you layer it over black. Last Light goes from teal to blue to purple, depending on the angle that you view it. 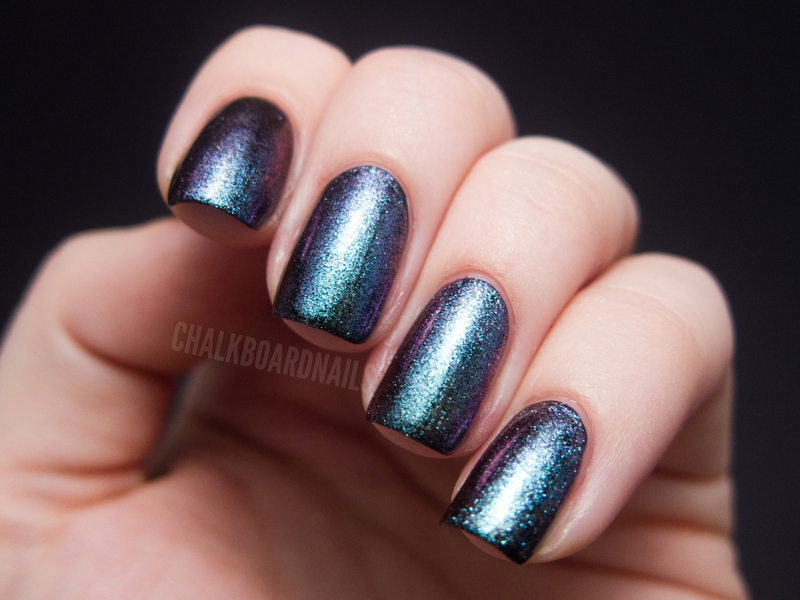 It has a "chunky sparkle," almost like a glass fleck polish. It's application is flawless, going on smoothly and evenly, and it doesn't show brush strokes at all. Here's Last Light on its own. 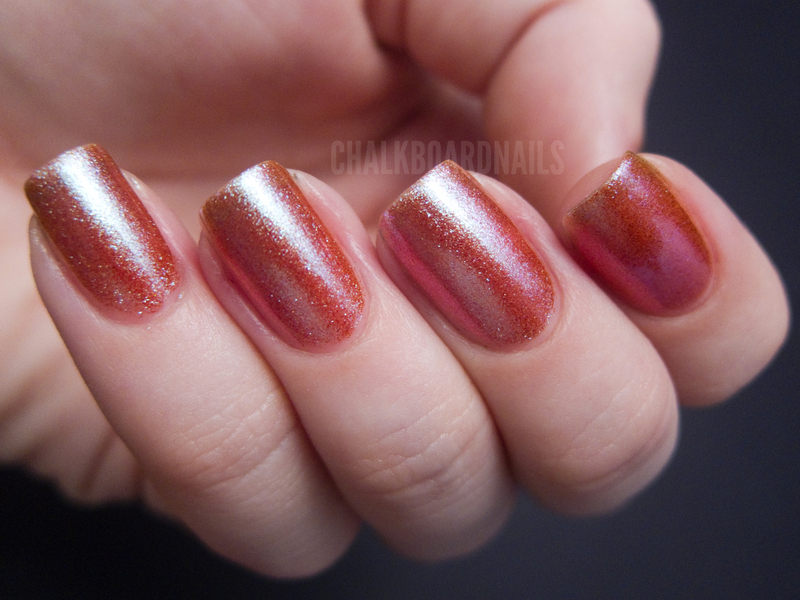 I used three coats for these swatches. Last Light is 15mL and retails for $17.95 on Ninja Polish and other similar retailers. While it's a great polish, I'm not sure that it's totally worth that price. I know Glitter Gal just started doing full size polishes, but this is one I'd rather get in a smaller size for a smaller price. Wow, didn't expect that it has THAT color, when I saw it on black O.o. On Black it reminds me of one of the catrice polishes from the million styles collection. I thought they are two different nail polishes. I can't believe it looks so much different on it's own. This is a very particular polish! OMG so beautiful! Un-freaking-believable over black! yup over black I'm swooning. but not for that price. Looks wayyy better over black.. so pretty! wow. had not a clue it was that completely opposite over black. just, wow. It's amazing over black! I wouldn't bother wearing it alone when it could look like that. These are both beautiful in their own way!! I wish this brand wasn't so expensive. *falls over* That is a lot of money.... Over the black it reminds me a lot of the Models Own Purple Blue. AHHHH such pretty colors! :) I love the shape of your nails, they are filed so perfectly! Gorgeous! I'd love to see how it looks layered over different colours, too. wow - can't believe how different it looks over black - awesome! What a stunning color! I prefer it over black, it looks incredible. Wow this looks amazing! Haha it looks so different over black! I love it! i bet it looks so different over loads of other polishes a real sneaky one there! Wow, I love it on black. Not so much on it's own! Never would have guessed this was the same polish. Beautiful polish! I was shocked when you showed it on its own after showing it over black! Such a difference!